Cleaning tests 10x superior to aqueous-based cleaners. 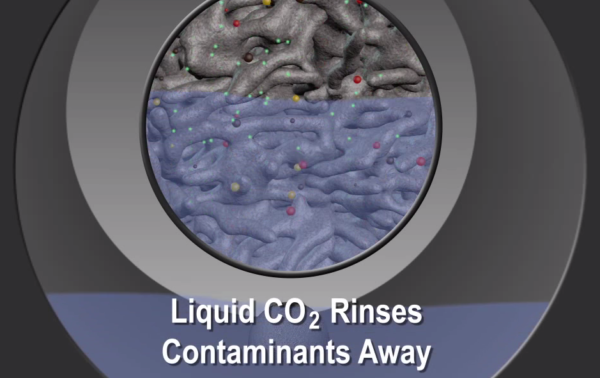 Liquid CO2 is used for sintered metal cleaning of porous implants that present a difficult cleaning challenge. The combinations of a very fine microstructure and varying depths make cleaning of these substrates difficult. Typical cleaning methodologies include multi-step ultrasonic process cleaning using both solvents and water, that must be followed by an additional drying process. Our dense phase CO2 cleaning system, Enertia™, successfully cleans titanium foam, metal sponge, and other metal foam substrates for the medical industry. Cool Clean Technologies Enertia™ is a complete liquid CO2 centrifugal cleaning system that includes both cleaning and recycling in a single compact unit. The process combines unique centrifugal washing and rinsing processes using specially formulated environmentally friendly high-boiling solvents with recycled CO2. The cleaning ability of the centrifugal CO2 process is derived from a combination of unique solvent cleaning power and physical cleaning action (i.e., centrifugal fluid shear, ultrasonic agitation and spray-under-immersion). Based on years of cleaning experience in a wide variety of cleaning applications, we have now reached commercial success in the medical orthopedic market, as the Enertia™ system is setting new standards in the demanding and complex sintered metal cleaning arena. Customers successfully conduct Enertia™ system cleaning tests on medical orthopedic implantable components with sintered porous metal and other complex geometric surfaces, which were contaminated with a wide variety of residues that include machining oils, particulate matter and other contaminants. With the Enertia™ system parts are removed clean and dry, eliminating secondary drying, and all fluids are recycled internally, eliminating the need for a secondary waste recovery facility. Typical customer cleanliness tests conducted on parts cleaned with the Enertia™ system include aqueous and organic extraction, organic carbon analysis, non-volatile residue testing, thermal gravimetric analysis, and particle residue testing. Customers find that the Enertia™ process produces sintered metal cleaning results that are an order of magnitude better than the current aqueous-based cleaning systems.